Orion McCarthy, a graduate from the University of Maryland, wrote a lovely article summarizing th e hardships facing fisheries today. From over fishing, to lack of scientific knowledge, to destruction of habitat, McCarthy referenced sources such as Wikipedia, YouTube videos, and to provide substantial “peer reviewed data” in this article. The data cited on the IPHC is accurate and his sources check out. However, upon further investigation of the sources later in the article, McCarthy lacks academic sources with empirical scientific data. The data collected through IPHC acts as a good reference for other marine fisheries management and ecosystem analyses as a whole. When referencing the methods used for halibut fishing, he claims that line fishing is the lesser impacting method compared to trawling, gillnetting, and purse seining, yet his sources only describe the process and do not establish a comparative analysis. 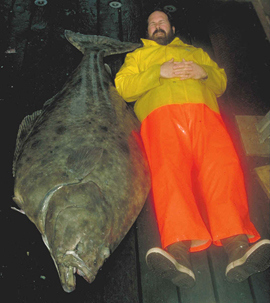 This article brought an enthusiasm for scientific fisheries management within the Pacific Halibut realm, but did not offer substantial scientific articles as references causing disconnect between McCarthy’s claims and the sources he cited. Hi. I would like to thank you for your description of my work as a “lovely article” and for your agreement that sustainability in fisheries requires sound science and baseline data. However, I take some issue with the characterization of my article as lacking scientific merit or backing. One of the goals of Conserve is to disseminate scientific messages to the public in a way that is easy to understand. By describing scientific processes and linking to commonly viewed and easily understood pages (such as youtube videos that allow readers to visualize a fishing practice, or Wikipedia, a site that provides basic information about a topic in a clear and concise way), the article seeks to engage broad audiences with content they will actually read, instead of linking to dense and lengthy peer reviewed articles. In writing this piece, I made sure not to link to any content (including wikipedia) that possessed information that I hadn’t also found from a reputable, peer reviewed source. By realizing that this post was designed as a public education/engagement piece rather than an academic review or analysis, I don’t think it’s unreasonable or uncommon to have links to sites that are more pedestrian and less academic, but engaging and easily understood, and I think the article is more effective using the links attached rather than if it had linked to empirical analysis or peer reviewed articles.